We all know drones can be used for a myriad of things, one of which is the commercial inspection of structures. This sounds straightforward, you fly the drone, it takes photos and videos, you look at the photos and video and react accordingly. That’s the 15th century way of looking at it, Intel has other ideas. As we’ve seen from Intel before, their Falcon 8+ drone matched with their advanced processing software, Insight, can do amazing things. 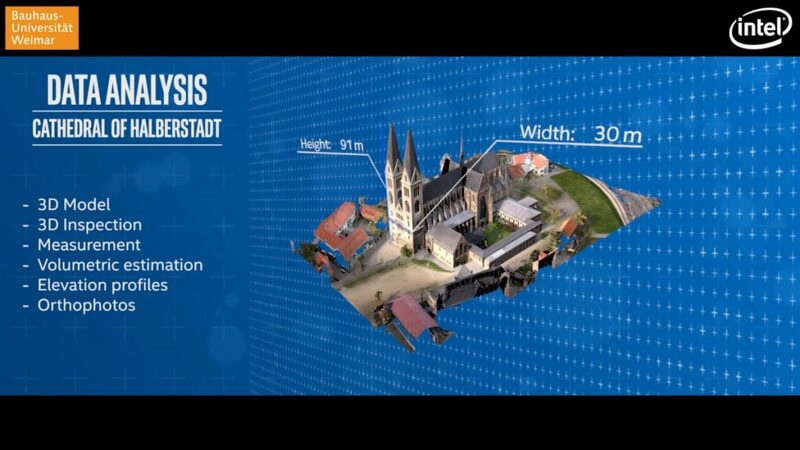 Today, they share their story on the detailed inspection and revitalization efforts for Halberstadt Cathedral, a 15th century structure in Saxony-Anhalt, Germany. This project has some interesting and exciting numbers associated with it. As Intel puts it, using 21st century technology to better maintain historic structures is a cost effective way to handle restoration projects. If you recall from InterDrone 2017, the Falcon 8+ flies, autonomously if you want, snaps photos and then the Base Station combines the images into a 3D model. If you collect the same inspection data multiple times, the software is able to make comparisons, very detailed comparisons, to help you identify trouble spots. Flying in Germany, Intel was in the air for less than an hour. In that time, they collected nearly 1000 images, plus some video footage, and fed it into the computers to create 3D models. They flew inside and out, detailing trouble spots from ground to ~300 foot peak. Let that sink in a moment. In one hour, the Falcon 8+ scanned and did a cursory inspection of the entirety of a very large building. It took a little over a day for the decently spec’d ‘high-end’ PC to render the 3D models, but just one hour from top to bottom to capture that data. I’d still be searching for a place to rent scaffolding, if I had to do it by hand. 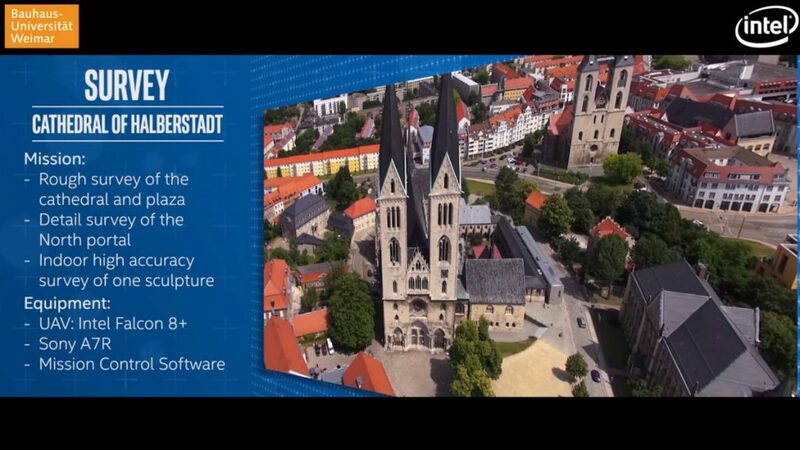 This is a three year revitalization project for this cathedral, and just the beginning for Intel and their inspection service efforts. We’re excited to see what comes next. Learn more about the Intel Falcon 8+ from Intel. Sample Flight Mission with Falcon 8+ Demo from Intel Drone Team on Vimeo.